We've just released three new user interface enhancements to the Insightly web application that saves clicks, increases productivity, and allows you to work faster. We noticed that most of the editing of records in Insightly involved changing the value of just a single field. So we have added the ability for our users to be able to change the value of a field when viewing a record - so now you don't need to navigate to the edit page of a record to alter a field's value. This is a huge time saver for those that need to change just an address or a phone number for a contact, or change the status of a task. It's really easy to use too. When you're viewing a record in Insightly, if you hover your mouse over an editable field that you want to change, a small edit icon will appear around that field's value (Pic 1). 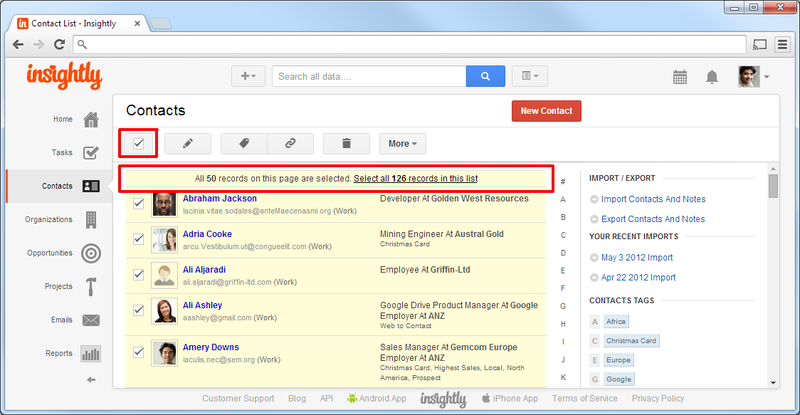 Clicking that edit icon will popup a small edit box and allow you to change the record's value right on the page (Pic 2). When you're done with the change, click the blue tick button to save your change back to Insightly, or click the X button to cancel your change. In-line editing Pic 1 - hovering over an editable item. In-line editing Pic 2 - editing a field's value. 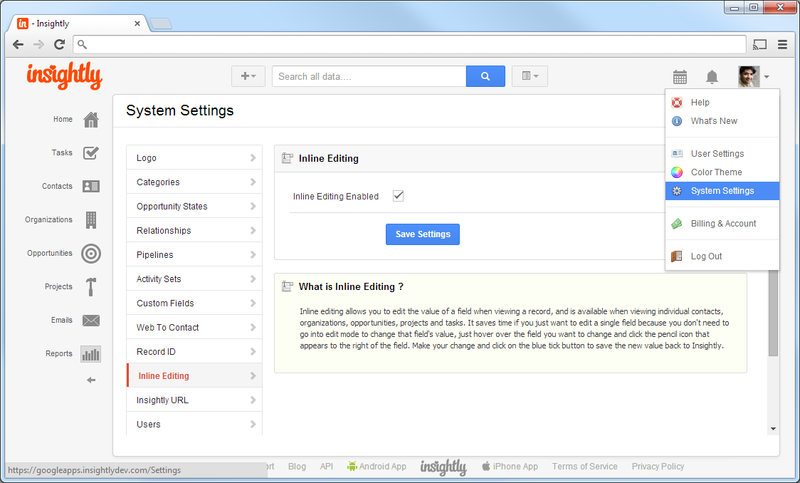 Pic 3 - Disabling or enabling in-line editing under System Settings. Another big time saving feature we've just released is the list actions menu - a menu that appears to the right of items in a list in Insightly when you hover over them (Pic 4). Clicking on the small gear icon that now appears will show the same 'Actions' menu you would see if you were to click on that item and view the details page and then clicked on the 'Actions' menu there (Pic 5). This new Actions menu allows you to directly edit a record, create a event or task for that record, or perform other actions like merge, delete, or export the record right from the list. So now you don't need to click through to view an individual record to get to those actions - you can do it right from the list screen (Pic 5). One handy tip is if you wanted to create a task or event in a new browser tab without leaving your position in the list, hold down the CTRL key (or the ⌘ key on a Mac) when you click on one of the options in the new Actions menu, and that screen will be opened in a new tab instead of the current one, so you can keep your spot in the list. If you have a large list of items, Insightly will show you the first 50 items by default and you can page through the remaining items using the pager navigation at the bottom of the list. To select all 50 items on that page without clicking on the checkbox next to each item individually, you can click the checkbox in the header of the list. But that would only select the 50 items on the current page - to select all items in the list including those in all other pages, you can now click on a small highlighted hyperlink that appears at the top of the list, as shown below in Pic 6. Hopefully these changes will increase your speed and productivity in using Insightly, decrease the number of mouse clicks and page jumps you have to make to perform common actions, and generally make you a happier person :-) Love your CRM. Great attention to detail, this is going to impact productivity, keep up the great work there. In-line editing saves a few clicks by not having to enter in and out of edit mode. I've also waited for the Select All feature for ages, it's especially useful when importing a large amount of filtered contacts. Keep up the good work! It keeps getting better. Easily 10x better than MS Dynamics CRM! You guys are great! Thanks for the constant little improvements that save a ton of time! I have been hard on you guys lately for the new interface issues, so I have to be fair and comment when you do something right. These changes are excellent and definitely improve productivity. I think this could even be taken one step further, however. 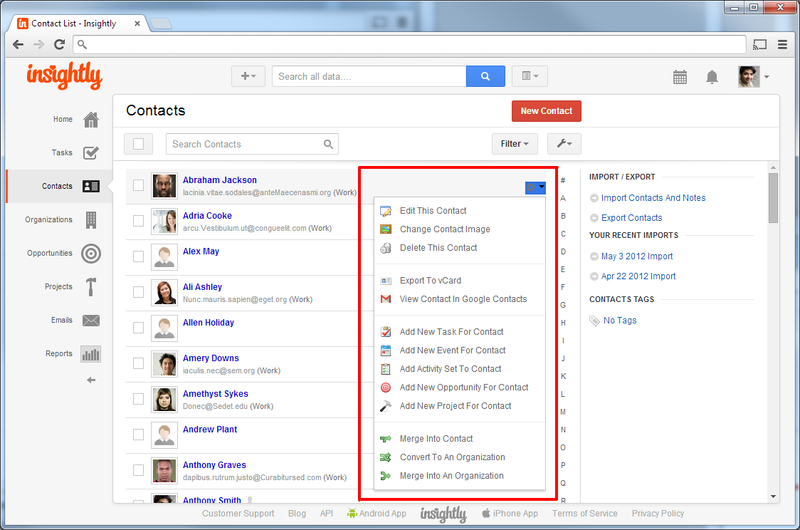 When creating a new Contact, Organization, Opportunity or Project, why not do what Google Contacts does, which is have the fields active so that once the first bit of data is entered, it is automatically saved. I am sure I am not the only one who has spoke to a client on the phone, entered all the information, then accidentally closed the window before clicking "Save" -- making an embarrassing call back to the client necessary. I forgot to add, another productivity improvement idea is to add on the actions button of a Contact, Organization, Opportunity or Project an option for attaching a file or creating a note . This is especially important in the new interface, because then if one wishes to keep the default screen to "About", he or she does not have to click over the "Note" or "File" tab every time one adds a Note or File. 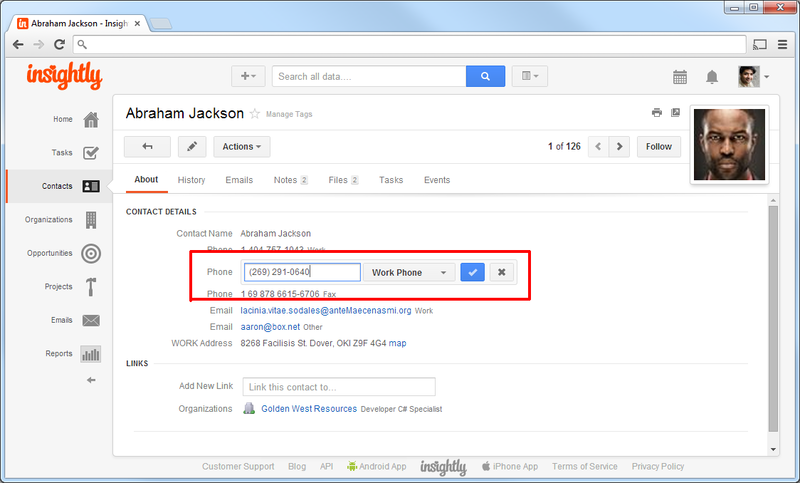 Of course, since we use Google Docs, you would need to have an option for this along with attaching a local file. All excellent additions, thanks! Though I'd like to add a couple items to the future wish list. 2. In contacts, a bulk edit command allowing the user add one note to the records of all selected contacts. I'll echo Pete's comment in that I've been vocal about the way the change to the new UI was handled and the UI itself so I wanted to say that I appreciate these changes. They truly will boost productivity with the new UI. I also appreciate that you've allowed comments on this posting. Thanks! Thanks for these Insight.ly! Would love to seem some additional features in the Reports area as well! Perhaps "scheduled reports" is coming soon? We have overcome the reporting limitations by hiring a company called Metric-X (metricx.com). They have used the API code to pull data from Insightly, manipulate it however we ask, then publish it -- in real time, no less -- to a dashboard in Klipfolio (klipfolio.com). I would recommend going this route rather than waiting for Insightly to create a better reporting system. Reporting is no specific to each company, they will never be able to satisfy all of our needs. THANK YOU, thank you thank you for sharing this information. I am SO glad to have select all back. Means I don't have to switch back and forth between v1 and v2. Thanks! David, I am glad to hear I have a supporter here. I have no problem with Insightly making mistakes -- we all do, as do the companies we own, run or work for -- but I just get frustrated when people stick their heads in the sand and fail to handle issues with grace, honesty and humility. My company, Underground Surveying, does not mess up very often; but when we do, we admit it and do whatever we can to remedy the situation. Regarding the new change, of course it was only matter of time before I found something I didn't like about it. Because we have so many opportunities and projects in system, we use a system whereby the names of them are rather large. Therefore, when linking an opportunity or project to Insightly via the Gmail gadget, we usually just highlight its name from the Name field from the About tab, click copy, then paste into the "Add link to:" field inside the gadget. But now that this change has been made, when pasting the name into this field, an extra space is found at the end of the name -- meaning we now have to back space after pasting. Any way someone can tweak the code to fix this. Am I the only one who cuts and pastes this much? Maybe I am. Alternatively, we would love to just be able to double click the Opportunity or Project Name from the title at the top. However, ever since the new interface was rolled out, not only does the name get highlighted, but the tags and the manage tags button do as well. Why did you guys make those part of the text in the new version? Is there any reason? Loving the new features, and like he Evernote integration under notes, but can we access it to add under a task? I'd love it if there were links to NEW TASKS, CONTACTS, etc available at all times with one click. Right now you have to either be on the tasks page to see the ADD TASK button, and so on, or CLICK the drop down to get the list of all possible ADD X features. I'd like ADD X, ADD Y, ADD Z, ETC at all times with one click. Maybe put buttons in the header? We already have that. The button to the left of the search box at the top on every screen allows you to add a new item of any type in just one click - thanks. Select all items and editable records comes as 2 great changes I loved. I always wished, if they were in place it would make my job hell lot easier and here you have heard my prayers. Kudos and many thanks to the Insightly Team!! This is really good and a big time saver. If I can add to my wish list the ability to take all my task for the day that I didn't get to and move them to the next day or reschedule the task date from that page that would be a huge time saver for me. The improvements now mean I can open the task and edit the date much more easily now but I still have to open each task. If I could do it from the task page by either dragging and dropping them to another day or bulk editing that would be great. Great enhancements. For in-line editing, why not just click on the field itself to enable editing? Marco. That's a great point. That would be the best way to do it. 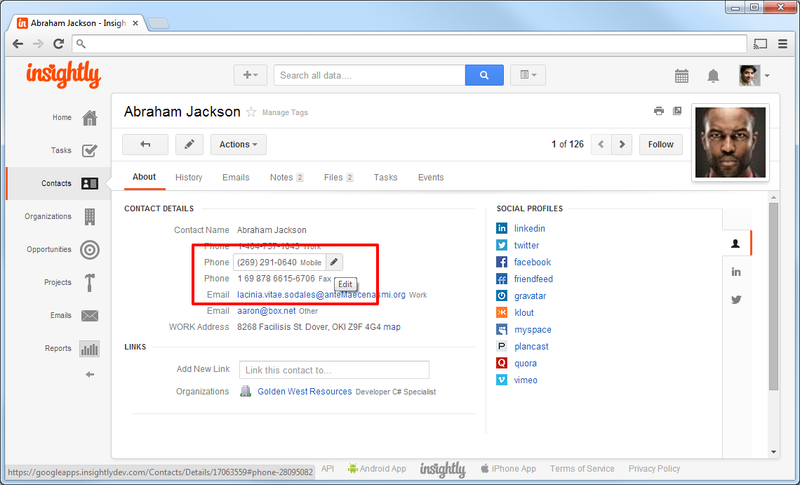 As I said earlier, active fields such as the ones used by Google Contacts is ultimately the best way to do it. We don't trigger editing by clicking on the field itself because some of our field's values are hyperlinks, and clicking on a hyperlink should jump you to that addressed page, not let you edit the value. We wanted to keep the editing action and result consistent across all fields so users don't have to re-learn different edit actions for different field types. Anthony, thank you so much for the explanation. Your response is greatly appreciated. 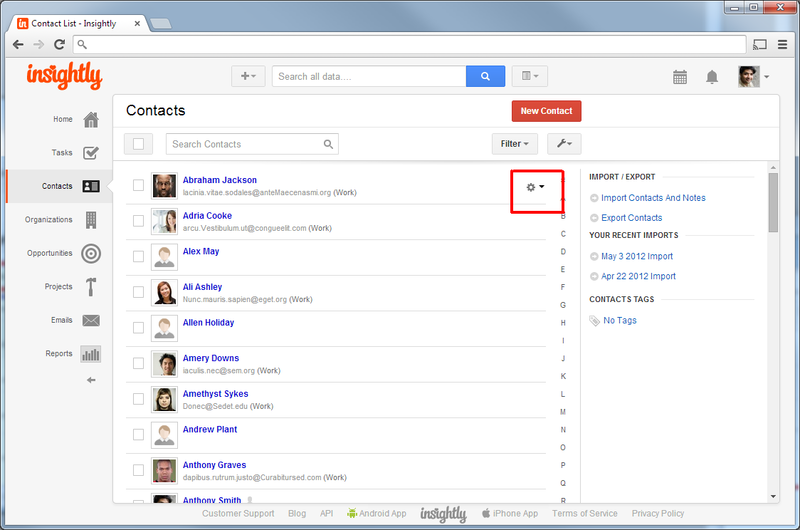 I just noticed in Google Contacts they got around that very problem by creating a hyperlink icon to the right of the information shown in the fields. Did you guys ever consider this as an option? Or did you think it would be too drastic of a change? Considering the fact that we recently had to adjust to the new interface, I don't see how it would be too much of a disturbance. These are good changes. We'd like to have such enhancements much more than visual appearance of the UI. Maybe a few more of such enhancements and our organization will switch to the new UI. In a mean time, still using the old one. Another one for the list would be when converting opportunities to projects, that the common fields in the project page are instantly populated and that all attached documents from the opportunity are not copied but moved to the now active project. Cameron, I concur. Being able to transfer across all the Notes, Emails, Files would be a great option. We have one employee here who would literally shout for joy, should this feature get added. Awesome updates! :) Keep 'em coming! I have discovered an issue with this new feature. Once a change is made to the info in one of the fields via In-line Editing, and one makes an attempt to view the data underneath the Notes, Emails, or Files tabs, the information underneath those tabs does not display. Is any one else able to repeat this issue? I cannot repeat that problem, Pete. Have you tried clearing your cache or trying in another browser to see if it does the same thing? Join our Android Beta Tester Program!